A large dumpster fire behind the former Leona’s restaurant, 3215 N. Sheffield, early Saturday is one of the latest alley fires to be reported in our area. Neither police nor fire investigators have officially deemed the fire to be suspicious. The restaurant's back porch burned in a fire on June 6. That wasn't officially suspicious either. Two weeks ago, however, prosecutors charged 22-year-old Eric Howard with setting two arson fires at a building just three doors north of Leona’s. Howard, on parole for burglary at the time of the fires, was returned to prison last Thursday. 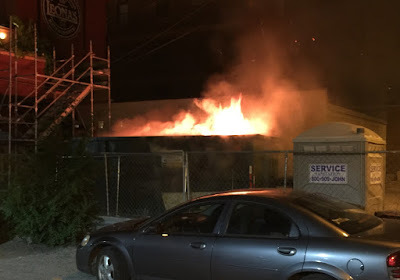 Other trash or alley fires were reported in our area last week on the 600 block of Roscoe, the 1200 block of Cornelia, and the 3000 block of Lincoln. None of them has been classified as criminal in nature. Early on June 25, surveillance video captured images of two men apparently setting fire to trash in the 3000 block of Sheffield. That fire spread to two occupied coach house, which were heavily damaged. No one has been arrested in the case, which the fire department said was not suspicious—until DNAInfo Chicago released the video.